Giving talks in the US in February! I received some requests already for giving talks in the US, and I really like doing this. Do be able to still teach and do research while giving talks in the US there are two options. Option 1: Yesterday I gave a first talk via Zoom to a group of teachers in the US. It was a new experience to me, but the teachers of Chesterton’s Kent School let me know afterwards they really enjoyed it. 2017 was a special year for a lot of people. I know that there are lot of reasons to have mixed feelings. I do have to admit that for me it has been a year filled with incredible stuff. I want to summarize my year in a couple of tweets, but the best news I received wasn’t tweeted. Yes, I became a Dr. June 9th, but the months before my PhD-defense my grandmother who in part raised me, was diagnosed with cancer – again – and it was very uncertain if my grandmother could be present at my defense – or even worse. But my grandparents were able to attend and a few months ago the best news of 2017 came: the chemo had worked even better than the doctors had expected and my grandmother survived the cancer. But there was much, much more. I’ve got the chance to meet great people in the UK, Sweden, the USA, Scandinavia,… I learned so much and still was able to spent a lot of time with my family. 2018 sounds promising… In January I’m starting with a new research project at the University of Leiden. I’ll also be visiting among other places: Haninge, Wellington, Pretoria, Toronto, DC and my solo debut will be published in English in March. Oh, and there will also be a new album by my band – I know, this sounds the least important thing on the list, but trust me: it isn’t. I want to wish you all happy holidays and looking forward to meet you all on the road in 2018! No funny on Sunday today, just a personal note. 12 years ago, almost to date, my wife and I were traveling through the US for our honeymoon. The biggest part of our trip was route 66, but as we are both music lovers, we did a detour to Nashville and Memphis. It was in Memphis, just after visiting the Stax-studios and the National Civil Rights museum that it hit me, well it hit the both of us. 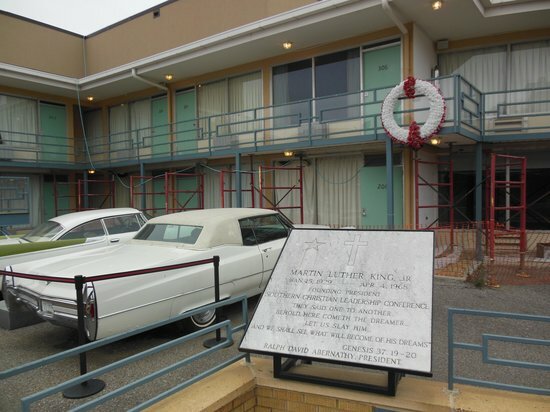 We were having a hamburger and a drink in a diner close to the hotel where Martin Luther King was shot. Nearby where we sat, there were some older black people also having lunch. They were in their late sixties, early seventies I guess. We realized that they had experienced the segregation. While for us it seemed like a strange and ancient history, it wasn’t. Since that moment I’ve seen how this all is still a work in process. A process with sometimes big wins, such as an African-American in Office, sometimes with big setbacks. But a process that can’t be stopped. As an European it’s flabbergasting to see symbols of our own awful past marching through the streets of Charlottesville, by doing so bringing together the worst of our combined histories. Symbols for ideas that are sadly enough also still popular with small groups in Europe, even in Germany. This is the presentation that I used for my deep dive session at the CTTL Academy at St Andrews in July 2017. I have something to admit: I love being in America. I’ve been a couple of times in NY, I drove from Chicago to LA with my wife on our honeymoon with unforgettable detours via Memphis and Nashville. 2 years ago we drove on route 1 with our sons, 10 years after our honeymoon and I’m afraid they’ve fallen in love too. When I started to think how much the United States have influenced my life, I found out very quickly that there is no end. From the classic movies I watched as a child with my grandfather, the Fender guitars that I use for my own music that is heavily influenced by the blues, jazz and country, heck my overweight is largely due to Coca Cola. Last year I was so honored to be able to have a first talk in DC, and you can’t imagine the big honor it was to be published by an American publisher and to have an article published in American Educator. I still have to make it in NY, because you if you can make it there… But it all goes much deeper. The first time I visited Ellis Island, the first I did check were the immigration-records for the brothers of my great grandfather Herman and my dear great uncle Clement who left Flanders to live in Detroit. They were a couple of the many, many immigrants leaving on the Red Star Line. My wife knows that when my head is getting overcrowded, I only long for one thing: a wide open road, somewhere between the two coasts. Now I don’t want to tell stupid things about politics and how wrong they are. Who am I to tell a country something? I don’t want to make comparisons as many do with the Thirties, it only reminds us how many mistakes we’ve made in Europe too. The only thing I want to share, is this: damned, many news stories I read and hear today hurt. It has been a blast, and it was truly an honor to be part of this great conference.